Students at South Cheshire College are over the moon after receiving cash grants from a Learner Support Fund to help them with their studies. Up to 50 students have benefited from the Mayor’s Learning Fund which was set up by former college student Brian Silvester, Deputy Leader of Cheshire East Council and the former Mayor of Crewe & Nantwich Borough Council. Councillor Silvester donated £5,000 from his Mayor’s Learning Fund to the high-flying college in the summer to help students meet the financial costs of further education. South Cheshire College Principal Peter Swift then matched that figure to swell the pot to £10,000 and students have snapped up grants of up to £200 to help them on a whole range of college courses. The fund has now been used up and many students are delighted with their cash bonuses which have helped them to pay for course fees, transport costs or materials for their programmes of study. During his year as Mayor in 2008/9 of the former Crewe and Nantwich Borough Council, Councillor Silvester chose Lifelong Learning as his theme and was delighted to hand over the cash to help current students. Students needed to be resident within the boundaries of the former Crewe and Nantwich Borough and be undertaking a course during the 2009/2010 academic year, which leads to a formal qualification or the awarding of a certificate, to qualify for the grants. Mature student Dave Graham was thrilled to benefit from the Fund which has allowed him to stay on at college for another year and edge him a step closer to part time work in the restaurant business. Dave, 59, of Aston near Nantwich, said: “I’ve already studied Pro Chef courses at NVQ Levels 2 and 3 but the Learner Support Fund has helped me to stay on at college and develop my skills on a Level 3 Patisserie and Confectionary course. “The cost of this latest course was around £750 so a grant of £200 has taken a massive chunk off the fee for me and I’m very grateful. Mother-of-two Laura Healy is studying a Book-keeping and Accounts City & Guilds course at college. Anna Baranowska, an NVQ Level 2 hairdressing student, has also benefited from a £200 cash grant. Anna, 29, of Crewe, said: “I’m very happy with the cash grant because I wanted to come to college to improve my skills. Councillor Silvester said: “Lifelong Learning is a cause close to my heart. Cost can sometimes stand in the way but hopefully these grants have helped local people to realise their ambitions and fulfill their learning potential. "I would like to thank all those who worked so hard to raise funds for this very worthwhile cause." Peter Swift said: "We were very grateful to receive cash from the Mayor’s Learning Fund and were pleased to be able to add to it. “The money has now been fully utilised by students from different backgrounds and from a number of courses across the college. The fund has also helped to establish a Scholarship scheme for people wishing to study for a degree at Manchester Metropolitan University's Crewe campus. Councillor Silvester added: ""As a former mature student who completed several courses at the College, I was delighted to able to give something back to today's students of all ages. 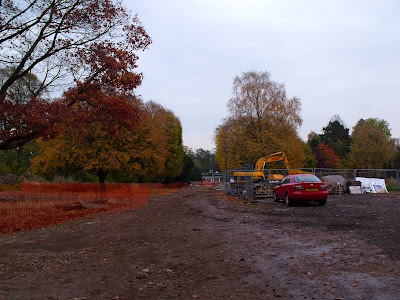 The first meeting of the Friends of Queens Park took place last week with a walk around the park behind the barriers to see how work was progressing. The new contractor is pressing ahead with great speed. The Name of the Friends of the Park group shall be 'Friends of Queens Park', hereinafter called "The Friends of the Park . 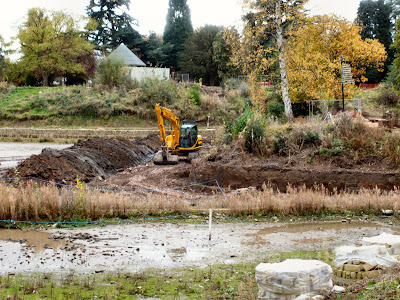 To promote the restoration (i,) capturing Queens Park's Victorian splendour, conservation and enhancement of Queens Park in Crewe, for the benefit of residents, visitors, wildlife and fish. (i) 2009 - Following a lengthy period of development and planning the Heritage Lottery Supported Queens Park Project is underway. 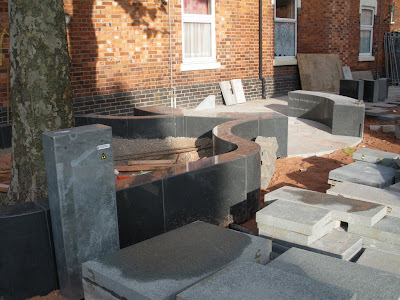 The Project Team has been assembled including architectural and engineering consultancies to complement the Landscape Architectural practice Bertram Hyde and Quantity Surveyors EMB Consultants. 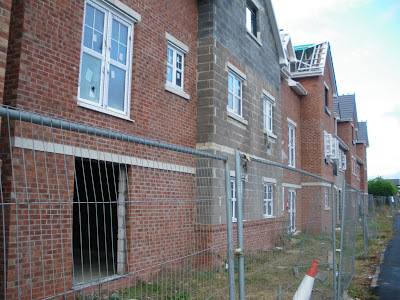 The practices selected are SBS Architects and the engineers are Scott Hughes Design, both are Manchester based. e) compliment other projects moving forward in Cheshire East. The Friends of the Park group shall be non-political and non-sectarian, and shall operate without distinction of gender, ethnic background, age, disability, sexuality, or religious, cultural or political beliefs. 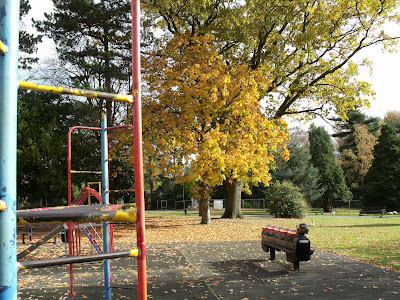 The area of benefit of the Friends of the Park shall be the area known as Cheshire East. The Friends of the Park group, through its Committee may exercise any necessary powers to do all such other lawful things as are necessary for the achievement of the above aims and objectives subject to the consent of Cheshire East Council as 'caretakers' of Queens Park. Membership shall be open (without distinction of gender, ethnic background, age, disability, sexuality or religion, cultural, or political beliefs) to those interested in furthering the aims and objectives of the Friends of the Park, provided that they have completed an application form and have paid the appropriate subscription fee. Membership shall be valid for the period of one calendar year from the beginning of April. No membership fees apply. All categories of membership shall be entitled to cast one vote. The Chairman may utilise a casting vote should it be required. The Committee shall have the right, for good and sufficient reason, to exclude from membership an individual member, provided that the member shall have the right to be heard by the Committee before such a decision is confirmed. The Committee shall consist of a Chairperson, Vice Chairperson and Parks Manager and any other such Officers as the Friends of the Park group may from time to time decide. The Committee shall total no less than 3 and not more than 16 members including two members of the Youth Council. a) The Officers and members of the Committee will be elected until the next AGM. They will be eligible for re-election. parties and refer any part of its business to them. d) The Committee shall have the power to fill any vacancies that may arise during its year of office by co-opting additional members. d) A member of the Committee shall cease to hold office if absent, conseceteviley on three occasions, without the permission of the Committee, from all of their meetings held within a period of six months, or notifies the Committee of their resignation in writing. e) A Committee member (including officers) may be removed from office before an AGM if two thirds of the Committee support a proposal of "no confidence" against the member, at a meeting of the Committee. a) The Committee shall hold at least six meetings each year i.e. approx. 8 week intervals. A special meeting may be called at any time by the Chairperson or by any four members of the Committee, upon not less than four days notice being given to other members of the Committee, of the matters to be discussed. b) At a Friends of the Park meeting the quorum shall be a minimum of 3 and include at least 1 Officer. c) In the event that both the Chairperson and any Vice-Chair are absent from a Friends of the Park meeting, the Committee shall elect a temporary Chairperson. d) Minutes of all meetings shall be kept by the Parks Manager and be available for inspection by members of the Friends of the Park group. e) Any member of other Queens Park associated committees may attend the meetings of the Committee as an observer. f) The Committee may, for a specific purpose, invite any individuals outside the Friends of the Park group to attend a meeting. At least 14 days written notice shall be given of the date, time, venue and agenda of Annual General Meetings. At least 7 days written notice shall be given of the date, time, venue and agenda of General Meetings. Non-receipt of a notice shall not invalidate a properly called meeting. b) Extraordinary General meetings may be convened at any time at the discretion of the Friends of the Park or at the request of at least 12 members of the Friends of the Park, in writing, to the Parks Manager of the group, giving details of the reason(s) for calling the meeting together with copies of any motions to be discussed. c) The quorum for all General Meetings shall be 12 persons including a minimum of 6 members of the Friends group, including 1 Officer. d) Any member of the public and/or press, may attend General Meetings as an observer. a) Every Member of the Friends of the Park group has one vote at General Meetings. b) Only Friends of the Park group members shall be eligible to vote at any meeting. c) In the event of an equality in voting, the Chairperson may cast a second deciding vote. d) When, in the opinion of the Chairperson, it is necessary for a vote to be taken at any meeting, this may be taken by a show of hands or by secret ballot at the Chairperson's discretion. The Friends of the Park group shall be able to receive, without favour, donations, gifts or contributions and empower the Committee to raise funds by legal means. a) All monies received shall be paid in to a Cheshire East holding account in the name of the Friends of the Park group. The Queens Park Manager shall be authorised to release funds as requested by the Chairman on behalf of the Friends of the Park group. b) All monies raised by or on behalf of the Friends of the Park group shall be applied to further the objectives of the Friends of the Park group and may be used to meet the cost of agreed projects and activities. c) The Parks Manager shall report on the state of the Friends of the Parks group finances at each Committee meeting and all transactions shall be made available for inspection. e) The financial year shall be from April 1 to March 31 . At the end of each financial year, the accounts shall be prepared, certified and presented at the next AGM. f) If the Friends of the Park group is dissolved, any surplus funds should be given to Cheshire East Council for expenditure with regards to Queens Park, in-line with the Aims and Objects of the Friends of the Park group. 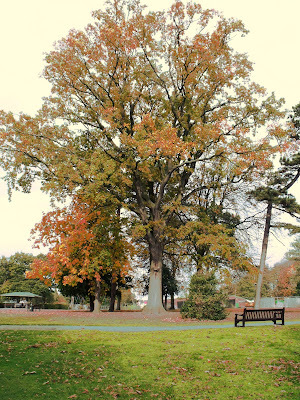 In all matters of dispute on the interpretation of this Constitution or on all matters on which the Constitution is silent, the Friends of the Parks group decision shall be final. The Friends of the Park group may at any time be dissolved by a resolution passed by a majority of two thirds of those present and voting, at a General Meeting of which at least fourteen days notice shall have been given, specifying that this is the purpose of the meeting. This Constitution may be amended in any respect (other than this clause) by a resolution passed by two thirds of the members present and entitled to vote at any General Meeting of the Friends of the Park group. Notice of any proposed amendment must be communicated to the Queens Park Manager in writing at least fourteen days before the meeting at which the proposal is to be moved. Notice, in writing, of these proposals shall be sent to members not less than seven days before the meeting. Please be aware of some recent Modes of Operation that have been used in the Eastern area that are of a suspicious nature. Only one of these reports have been reported from the Crewe & Nantwich area. However, this type of crime is very mobile and people who engage in these types of crime will travel between towns in the county and further afield so please be mindful of these methods. 1.) Water & Gas - White van pulls onto callers drive with 3 males onboard. 1 male (aged 18-19, approx 5"7', short, brown hair, grey bomber jacket and jeans) knocked on the door stating he had come to cut off the gas. Resident questioned him and was told that they had recently had a gas installation, pointing at their outside gas meter, and that he would need to come upstairs to switch the water off. Resident declined entry and asked for ID and at this time the male walked off back to his van. 2.) Resident received a call from someone claiming to be from the home office offering to send someone to fit a burglar alarm. When challenged caller terminated call. Number was withheld. 3.) **Reported from Crewe area. ** Male (short beard, white pullover, grey trousers) called at residents door stating that he needed a new driveway as by law it has to look nice. He then proceeded to ask resident questions about their financial situation. Male was on foot, did not have any ID but did have leaflets with him. I appreciate that many members are quite clued up on this type of crime but it is useful to be aware of some of the methods used. Some of these individuals are very convincing, operate in a confident manner and can be quite official looking and depending on the circumstances people can sometimes be taken in by one of these callers whether it be by phone, at the door or on the internet. Those engaging in doorstep crime in particular often target more elderly and vulnerable people. 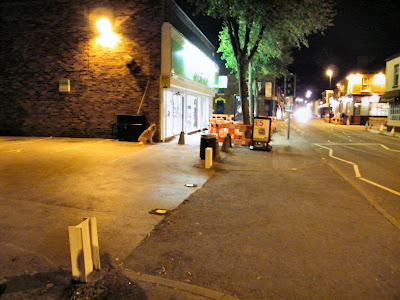 West St has been hell this week as its been closed to traffic as the road surface is redone. There has been total chaos all week with people going down the road even when its closed. getting to shops or to Oxford St Derby St has been a nightmare and there has been a lot of near misses accident wise. Its hopped the end is in site for the renovation as people have had enough the shops have closed all week with lose of money and even places like Morrisions have seen fewer customers. Some of you may have seen the above van in the area or even gone down Samuel St and seen the newly opened Charity Warehouse were you can get your furniture cheap. They will also come and remove your old goods for you to save you going to the tip. Isn't it good to see everything being recycled and being used by a charity? Charity Commission Direct - Caseworking Team t: 0845 300 0218 confirmed this is NOT A CHARITY. So were does the money GO? Need FREE help with your PC? Do you need some FREE help with your pc? I am now on the Staff of the worlds largest help forum which is run world wide. As its world wide its staffed 24/7/365 so if you have a problem and no one else can help you this is the place to be. You will normally get an expert answering you problem with 30 mins very often with 3 mins and its all FREE. Ok, finally ready to offer pre-orders on the new book, Crewe and its People. It's a hardback book, 190 pages, over 200 photos, 40 fascinating stories - £9.99 if you buy now! Along with another couple of local authors, Mark and Tony, I've decided to publish this myself, as I did with The Gradi Years - nine years ago! So, although that ensures that you retain control of the project, you have all other associated hassles that go with it. One of those is deciding how many to print, as we pay the printer direct! So pre-ordering gets you a few quid off and is a massive help as we go to print. This phase is for collection only, from the book launch on Friday 27th November at Hops Bar (5pm-7pm), or from Copnal Books on Meredith Street, any Friday or Saturday from November 27th. "Step into the lives of forty Crewe people and explore childhood memories, triumph, heartache and the special moments that have defined a town's recent history. From teachers, musicians and factory workers, to politicians, historians and engine drivers. Crewe and its People criss-crosses lives just as the labyrinth of rail lines still defines the proud, hard-working Cheshire town..."
If you still like the old-fashioned cheque method you can post £9.99 (payable to J. HORNBROOK) to: Crewe and its People, c/o Copnal Books, 18 Meredith Street, Crewe CW1 2PW. Alternatively, there's an eBay item here where you can follow the PayPal or other cards route. Item number is 230385033563. A local Home Watch Coordinator has reported that one of her elderly neighbours had her purse stolen in Nantwich town centre last Friday by a man who offered to assist her when she was struggling with her bag and walking stick. Unfortunately, she did not report the incident at the time but has since made us aware that this occurred. Due to the busy nature of town centres they can be targeted by purse dippers and pick pockets. Whilst people are shopping as they are often busy, more stressed and flustered they can often forget to put their purse away properly or leave their wallet in their rear pocket or may just be more distracted in general. Due to the busy nature of town centres it is easy to get nudged or jostled at times and people often won't realise their purse or wallet has gone until they come to use it again. It is important to be aware of this in the run up to Christmas as town centres become busier still and people are often more stressed rushing around to buy presents and complete tasks for Christmas. Please be mindful whilst out and about and take care with your purse and wallet. seem sure of themselves and aware of their surroundings make less attractive targets. make him or her believe this is your real wallet. an unsuspecting victim in a crowd. This may be a distraction technique. later know exactly where to lift your wallet. •Walk with confidence and make eye contact to discourage pickpockets. • Avoid carrying your wallet in your back pocket if possible. Front pockets are safer. more difficult to get the wallet out of your pocket. your wallet is stolen, you still have some money. • Consider carrying your valuables in a money belt under your clothing. • Avoid drawstring purses.A purse with a zippered compartment works best. • Carry your purse in front of you. • If your purse has a flap,wear the flap against your body. • Avoid hanging your purse on the back of a chair in a public place. Place it in your lap. • Never leave your purse unattended. Homes and property can become more vulnerable as the evenings get darker throughout the autumn and winter period. Now is the time to remind scheme members of some of the steps that they can take to protect themselves during these months. 1. Invest in some timer switches which you can set up to allow lights to come on in your property whilst no one is home. If you are habitually out at certain times consider changing the times that the lights come on and off every so often so there isn’t an obvious pattern. 2. Ensure that boundaries around your property remain in good repair this includes fences, hedges and any other vegetation. As trees, plants and hedges lose their foliage take time to check your property for any thin or weak spots that could offer easy access to your garden and take steps to rectify these immediately. 3. After getting your garden ready for the autumn/winter months securely lock away all your tools. Tools that are left lying around can be used to assist in committing a crime on your property or a neighbour’s property. 4. Take a look around your property and identify any areas where you could improve your security - aim to tackle these issues sooner rather than later. Unfortunately, most people only seriously consider their security after they have become a victim of crime. 5. Close your curtains when it is dark. Brightly lit rooms draw the eye of passers by offering an ideal opportunity for people to see what you have inside your home at a glance. 6. As town centre’s start to get busier in the months running up to Christmas they can be targeted by pickpockets. Be mindful where you keep your purse and wallet. Purses should be secured in your handbag; handbags should always be fully shut and worn to your front. Wallets should never be kept in back pockets. Bear this advice in mind when attending other busy upcoming events such as a local bonfire/fireworks display. 7. In the run up to bonfire night encourage neighbour’s to report any unofficial bonfires that appear to be sprouting up so that they can be removed by the authorities. 9. As the weather becomes colder and more frosty don’t be tempted to leave your vehicle unattended whilst defrosting your vehicle. Many motorists will either leave their vehicle insecure or will lock the doors with a spare key whilst they go inside. Remember it only takes a matter of seconds for a thief to drive away with your car. If you are unable to place your car in a garage or a car port ensure that you stay with the car while it defrosts or invest in a protective sheet so the windscreen does no get frosted up. 10. Darker nights afford criminals the opportunity to be less visible whilst they engage in crime. Ask all members to be vigilant and to report any suspicious behavior directly to the police. West St revamp is still under way and this week the Co-op re opened after a £250,000 revamp it was ruined by the barriers and rubble out side as the pavement hasn't been finished yet.